The first time I saw the band name was while checking something else at Armellodie records. The first thought that came to my mind was ‘that’s vaguely like Lloyd Cole and the Commotions’. What are your thoughts on the importance of a band’s name? The next thing I did was listen to ‘Blister’. 3.27 later, I immediately shot off an email to request to send you some questions. It took one listen to know that this record was going to be one of my favourites of the New Year. Are there any releases by other Scottish artists you are looking forward to in 2012? The 2ndsong, I listened to was ‘Tell the Girl’. After that it became clear why my reaction was so visceral. Everyone that encounters your music will have a different frame of reference and signposts, but for me it was 1980 again – post-Clash inspired guitar bands. You remind me of one of the most influential bands of my youth – Blue Peter. I guess the vocal harmony in the song and overall guitar jangle resonates with me directly. Guitar band is, of course, a silly label. How would you describe the music you make and what has helped shape and inspire it? It was extremely kind of you to let me listen to the entire record. Listening to it repeatedly, it is clear that although the overall sound is suggestive of the past, it is still uniquely your own and as ‘modern’ as any new release. How was the album put together? “That’s certainly what we were aiming for, as much as I love a lot of classic records, I have no interest in trying to just ape them, fetishising the past is a creative dead end, you take what you need and move on with it. I had said when we went into the studio that we were there to make a modern sounding record, there is no point pretending it wasn’t recorded in 2011. We recorded the album with Andy Miller at his Gargleblast studio (he has engineered a lot of the Mogwai albums as well as Life Without Buildings and De Rosa). I love how you’ve included 16 tracks. The last song ‘Better Than This” is conspicuously longer. Was there a particular reason for using this for the closer? ‘We actually went through a few different versions of the track listing but we settled on that as the last one as it put a nice capper on the record, after the 15 short and for the most part furious songs it gives the album a nice change of pace before it finishes, and although this wasn’t part of the decision it touches lyrically on a lot of the themes of the album so it works well as a final track. Could you cite any Scottish bands you found inspirational? What would you say was your favourite Scot release of the last year? I’ve been reading some band comparisons that others have made that make me both cringe and chuckle. If you could be compared to a cross of any 2 bands, who would they be? I predict a tremendous amount of success with this. I’m pretty sure I’ve got the first of my best of list for 2012. I noticed you are releasing a special‘faux-vinyl’ cd edition. I have to confess that feels me with a good deal of dismay. Is an actual vinyl release just not in the works? Perhaps later? “Thanks, I hope you’re right about the success. The‘faux-vinyl’ CD’s are actually for the two singles we released which are only available at gigs and our website (each CD has two non album b-sides). I would absolutely love to release all our stuff on vinyl, however realistically we are on a small (but wonderful) label and the cost of manufacture for vinyl is too expensive, particularly when most of our sales so far have been downloads. I imagine that a North American visit is not going to be in the cards next year. What plans do you have to tour the new record? Of course, CD/EX really don’t sound like anyone else. My take is that band comparisons are thrown around way to lightly. But it did remind me of a time and place from my youth and Chris even took the trouble to search for the reference. – I maintain that ‘Radio Silence’ earns a spot in my best of all time top 10 and that ‘Almagamation and Capital’ will certainly rank as one of the best of this year. 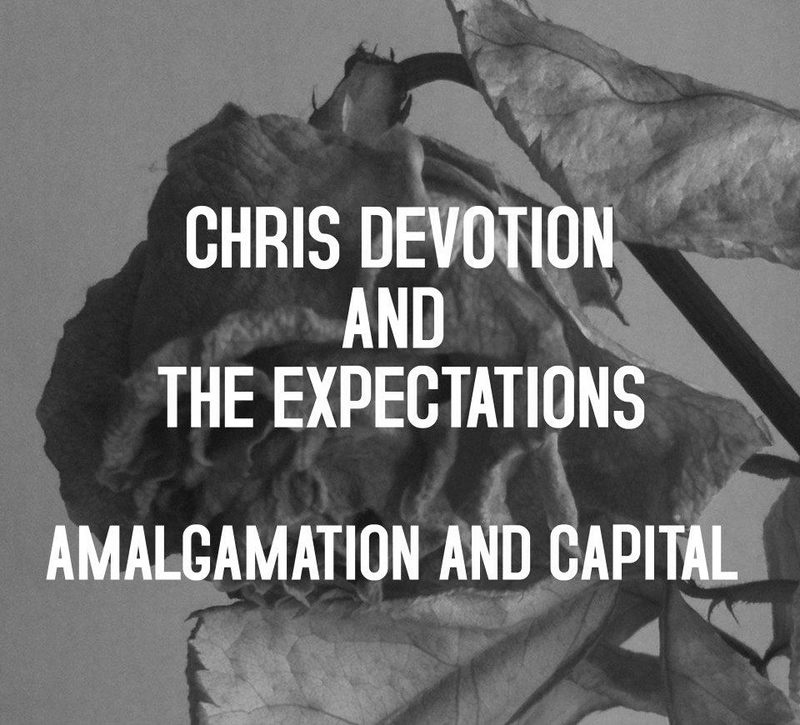 This entry was posted in Bands We've Chatted With and tagged Chris Devotion and the Expectations.